When your computer can’t enter Windows normally, how to do? If you have a bootable CD on hand, you can put it into CD-ROM, then set boot from CD. Then you can fix error in the Windows recovery environment. Now, not only CD, but also USB can be bootable media. 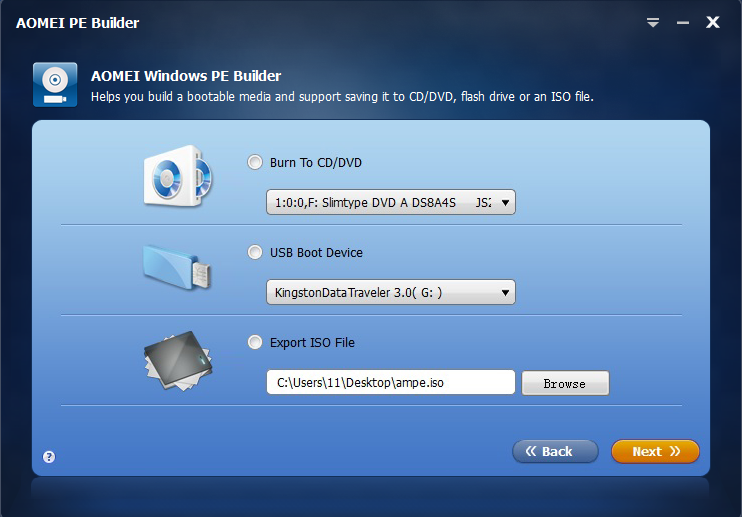 Here we will introduce a free tool called AOMEI PE Builder, with which we can create bootable usb by ourselves easily. As its named suggested, it means build a PE environment by yourself as you wish. Windows PE or Win PE is short for Windows preinstallation environment. It contains the minimum requirement to boot and run system. So it is used for test the computer functionality or organizes some service before the actual installation. To create normal PE environment, you have to pre install windows AIK/WAIK or prepare a windows installation disk. 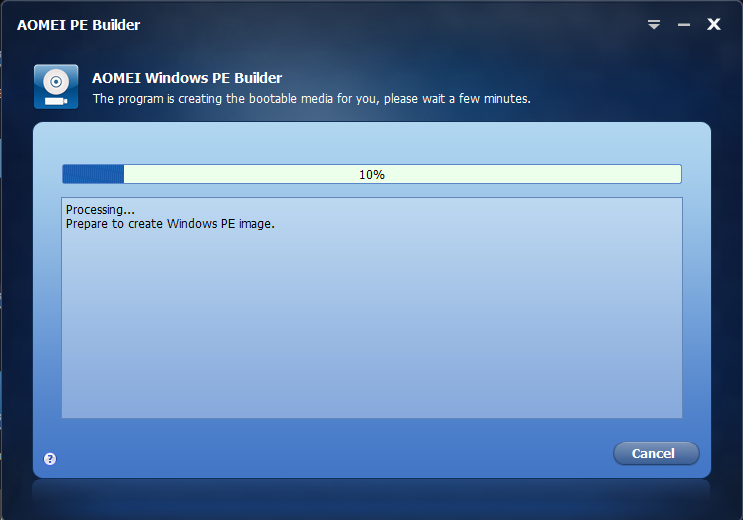 But with AOMEI PE Builder, you don’t have to do this to create PE environment, which will save you lots of time. You will find that create rescue media will never be so easy. Meanwhile, AOMEI PE builder comes with a lot of common utility tools such as backup and recovery tool and partition tool, etc and also gives users the right to add tools or drivers as they want. AOMEI PE buider bundles with their two main core products: AOMEI Backupper and AOMEI Partition Assistant. It can help you to recover system, back up or restore files and partition hard drive. Other utilities are also available, such as Recuva, Sumatra PDF, 7-Zip, Filezilla, OSFMount and NTPWEdit etc. 1, Start AOMEI PE Builder and click “Next” in the first wizard page. 2, Add tools and drivers you frequently use here. “Add file/folder” can include the tools you need to Windows PE. AOMEI PE Builder will create a shortcut of a folder named “My Tools” on the desktop and put your added tools in the folder. 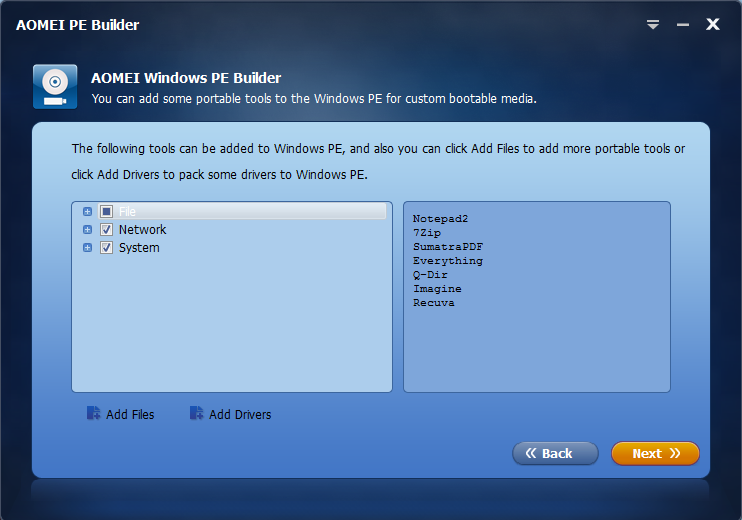 “Add Drivers Files” can add the drivers you need to a list and PE Builder will automatically install them to Windows PE system. Note that you can only add the driver files whose extended file name is “.inf”. 3. When files and drivers are added, click “Next” to enter the interface on which you can select to what media to create Windows PE. As the picture shows above, you can create Windows PE boot media in three methods: Burn To CD/DVD, USB Boot Device and Export ISO File. Creating bootable Windows pre installation environment has been so easy with the help of AOMEI PE Builder software that everyone could finish the hob even the most basic computer users. 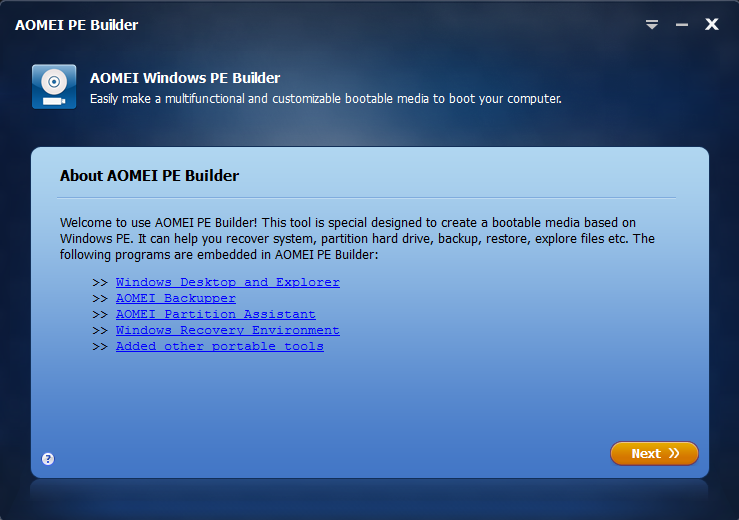 AOMEI PE Builder utility helps in creating PE environment which enables you to boot up your computer for easy maintenance and fast recovery tasks when the native Windows system is corrupted or cannot be used. You ca try this freeware at anytime when you need, highly recommend!